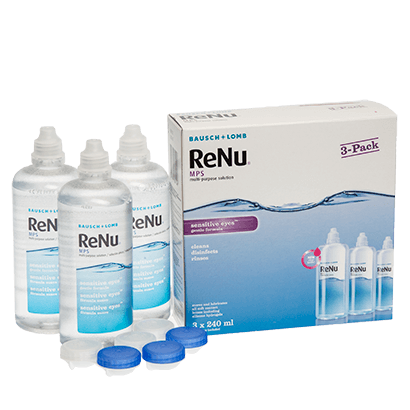 Cleaning, rinsing, disinfecting and even storing your lenses is made easy with ReNu Multi-Purpose Solution Triple Pack, for everything you need in one bottle. Crafted by renowned manufacturers Bausch & Lomb as part of the bestselling ReNu range, the multi-purpose solution is available in a value pack for even greater savings. ReNu Multi-Purpose Solution works to effectively remove dirt and clean all types of soft contact lenses, including silicone hydrogel lenses. The contact lens solution is particularly effective for sensitive eyes and offers outstanding comfort when wearing your lenses. Notably, this is the only solution that contains Hydranate. This is a unique ingredient that works to eliminate protein deposits and rid your contact lens surface of any bacteria or germs that may build up. This feature by expert manufacturers Bausch & Lomb enhances lens wettability and as such, contact lens wearers can be sure of a healthy and hydrated lens wearing experience. ReNu Multi-Purpose Solution Triple Pack includes three 240ml bottles, along with 3 lens cases. For added convenience, at FeelGoodContacts.ie we offer this product in a handy Flight Pack, to carry with you on the go. Read our helpful guide on how to clean and store your two weekly and monthly contact lenses.